The US dollar traded mixed on Friday, the first trading day of September, as investors were digesting the newly-released jobs report. 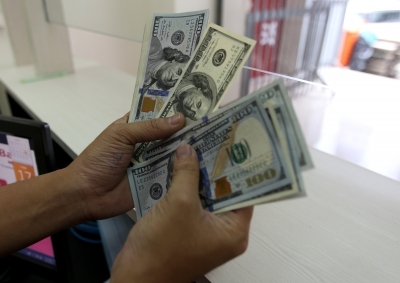 In late New York trading, the euro decreased to $1.1867 from $1.1907 in the previous session, and the British pound increased to $1.2955 from $1.2927 in the previous session, Xinhua news agency reported. The Australian dollar increased to $0.7970 from $0.7847. The dollar bought 110.23 Japanese yen, higher than 110.02 yen of the previous session. The US dollar rose to 0.9649 Swiss franc from 0.9596 Swiss franc, and it was down to 1.2394 Canadian dollars from 1.2504 Canadian dollars. US total nonfarm payroll employment increased by 156,000 in July, missing market expectations, and the unemployment rate edged up to 4.4 per cent, the US Labor Department said Friday. Investors have kept a close eye on the nonfarm payroll report, looking for clues for the Federal Reserve’s next monetary policy move. Expectations for tighter monetary policy in the United States have been dampened recently by soft inflation data. Market expectations for a rate hike in December are just 37.3 per cent, according to the CME Group’s FedWatch tool. The dollar index, which measures the greenback against six major peers, was up 0.12 per cent at 92.780 in late trading.